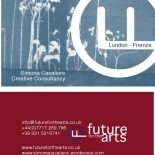 Welcome to Future for the Arts Consulting. We are the dedicated Cultural Management spin-off of the Italy based Consultancy Futuro. Whether you are a small theatre company struggling with fundraising, a national or community museum aiming at broadening up their audience, a charity or an arts centre needing advice to set up a new exhibition, you’ll benefit from Future for the Arts’ flexible and dedicated approach. We offer a wide variety of bespoke services ranging from strategic development, exhibitions organisation and dedicated curatorial work, research and bespoke learning programmes.